The EK Direct/Indirect Luminaire is a classically styled fixture fit for any interior. They are designed to be pendant mounted via a rigid or cord pendant making them adaptable for a number of ceiling types and applications. The direct/indirect lighting configuration provides ample downlight for tasks or general illumination while providing an aesthetically pleasing uplight to brighten spaces and eliminate the “cave” effect. Comes standard with lamp dividers to field customize the percentage of direct/indirect light being delivered. 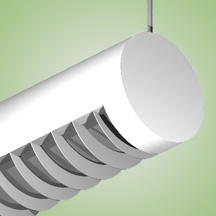 Provided with a ribbed acrylic diffuser on the top side of the fixture and the option of a ribbed acrylic diffuser or baffle on the bottom side.